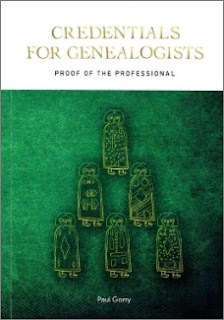 Sure enough, Paul, a professional genealogist for more than 40 years and a founding member of Accredited Genealogists Ireland (AGI), does advocate accreditation as the only certain means of proving competence and experience, and he sets out his thoughts on this controversial topic in a determined and thorough manner. As I'm not a professional genealogist, nor a potential or past client of one, I'm not going to jump into the controversy publicly. It is, I think, for those working at the heart of the industry to debate the important issues Paul raises and to consider their impact on the future development of the sector and professional genealogy as a career. From my 'happily amateur' position on the sidelines, however, I can tell you that I found the book educational and thought provoking, and I imagine many of today's pro genies will wish such a book had been in existence before they took their career leap. I expect many will find Section 1, which sets out a history of the development of professional genealogy and credentials across the globe, highly informative of the industry they have joined or seek to join. Section 2 concentrates on genealogy, academia and education, and was an eye opener; it explores how the academic course provision lobby has successfully created demand and supply for formal qualifications for nearly all careers, and in the process edged 'Experience' from its long-held position as the top-flight of attainment, even in the one-time cottage industry of genealogy. Paul writes: "From the perspective of a genealogist rather than someone promoting a course of lectures, I would contend that there is one important difference between holding a certificate or diploma and being accredited as a genealogist. The certificate or diploma shows that the holder has knowledge of genealogy acquired through academic learning. Accreditation shows that they have both knowledge of genealogy and experience of genealogical research, regardless of how they were acquired." Section 3 – Developing a career in genealogical research – is a gift to a new and upcoming generation of professionals from a knowledgeable, experienced and highly-respected mentor who deals in facts not dreams. Any hobbyist who has ever uttered the words 'Oooh, I'm passionate about genealogy, I am' might have an occasional notion of turning said passion into what they think may be a money spinner. This no-nonsense and practical chapter of the book should help them think long and hard about the realities of the professional job; their suitability to what is nearly always self-employment; their possession (or otherwise) of the necessary attributes of self discipline and commitment to accuracy; the strength of their research, writing and technological skills, and so on. Paul then dives into the main debate about accreditation in today's market. He presents the findings of a survey he carried out over three years among a number of professional genealogists around the world. Some had credentials, some did not. None is identified, because each was assured confidentiality. Their answers are thoughtful and widen the debate into the value of accreditation to the practitioner, and to what practical changes accreditation bodies themselves might do to ensure accreditation retains its status within the industry. Finally, Paul sets out his own personal observations. Warning: your reading may be interrupted by a few involuntary intakes of breath. He doesn't hold back, but that's his call: they are personal opinions, bravely aired, whether you agree with him or you don't. Paul stresses that his book is not an assault on those genealogists who choose not to (or cannot) seek credentials. "It is," he writes, "a defence of the overall need for accreditation for the good of the general public and the profession. While there are many excellent professional genealogists who do not hold professional credentials, there are many others who are inexperienced or inept. How is the public to know the difference?" Credentials for Genealogists provides a fascinating and deep insight into a cottage industry that has developed into a global professional and technologically-driven market. It is also a reference book – more than a third of the 250 pages are made up of appendices, glossary, bibliography and index. It can be ordered from Blessington Books, price €16 plus p&p.